Spays & Neuters - Spays and neuters are recommended at four months of age and at least four pounds in weight. All spays and neuters are sent home the same day and go home with pain and anti-inflammatory medication. We recommend pre-anesthetic bloodwork, fluids, a microchip and laser treatment for all spays and neuters. Declaws - We do our declaw procedures Mon-Thur. We only declaw the front two paws. We recommend this procedure be done at the same time as your cats spay or neuter. Declaw procedures do have to stay over night. Your cat will be sent home with pain and anti-inflammatory medication and a bag of special litter. Non-Routine Surgery- We are able to do many types of non-routine surgeries, including but not limited to, Cruciate ligament rupture (MRIT), luxating patella repair, bladder surgery, tumor removals, biopsies, foreign body removal and surgery on all major organs. We are also one of the very few hospitals with the ability to do Laparoscopic Surgical Procedures, which are minimally invasive & result in less pain & quicker recovery. 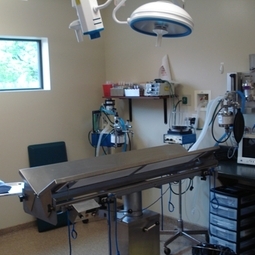 Why We Are Different - ALL patients under anesthesia at Serenity Animal Hospital are monitored during the entire procedure. EKG, Pulse Oximetry, Respitory Rate, Heart Rate and Blood Pressure are recorded every 5 minutes by a Licensed Veterinary Technician. This allows us to watch trends and be able to catch a problem quickly if one arises. Our Doctors and Techs go through annual training to make sure that we are up to date on the most current anesthesia and pain control therapies.